That’s because I’ve being going through the living hell that is moving house. But now we’re in, if not unpacked, and still edging our way through rooms crowded with boxes – mostly containing books (I don’t know where they all came from and I still don’t understand how they’re all going to fit in the new house). I’m in Sydney this morning, having come up for the NSW Premier’s Literary Awards, in which Act of Faith was shortlisted for the aptly named Ethel Turner prize for young adult fiction. Vikki Wakefield, All I Ever Wanted (Text). I was thrilled and a little amazed to see my book listed alongside those titles. The beautiful Only Ever Always won the Award, and we all dined and felt terribly glamorous in the beautiful Mitchell Reading Room at the State Library of NSW. Editing has begun on The Sultan’s Eyes, work on the cover design is quite advanced, and I should have the manuscript back to look over the edits in a couple of weeks. What happens then is that I check and recheck, then the changes are made and the editors check it all again, it gets typeset, then we all check it again. And possibly again. By which point we’re all thoroughly sick of the thing and don’t want to see it until it arrives in a box with a picture on the front. In the meantime, it’s back to focusing on La Maupin and academic conference papers, and a hectic time at work, before taking a summer break in which I intend to read a whole lot of books that have nothing to do with the seventeenth century. 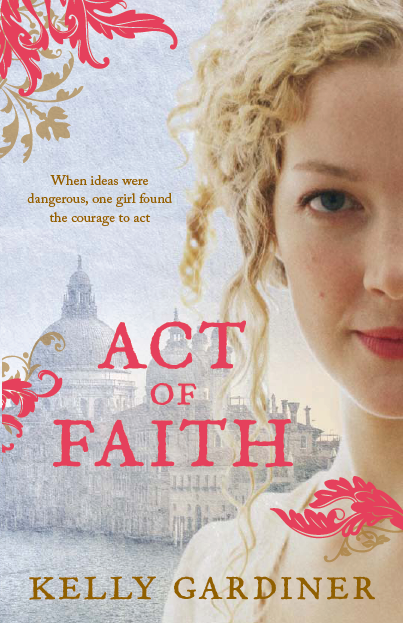 I haven’t read Only Ever Always – it must be good to get more votes than Act of Faith. Congratulations, again, on making the shortlist. It’s a great book. Thanks so much, Elizabeth. I’m sure you have plenty of books in your To Read pile but I highly recommend adding Only Ever Always.